The tragedy had happened 80 years before I’d even arrived; and events had come together so that I could visit Seacliff to witness the results of that tragedy for myself. 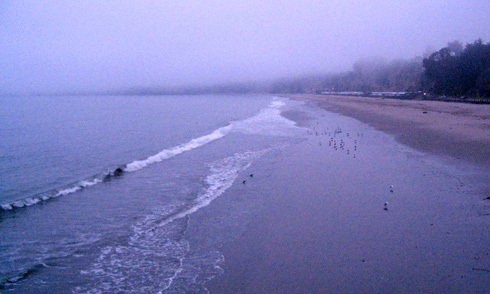 When I arrived at Seacliff State Beach (safely near Santa Cruz), I was surprised to be struck by the realization that I’d been here before. 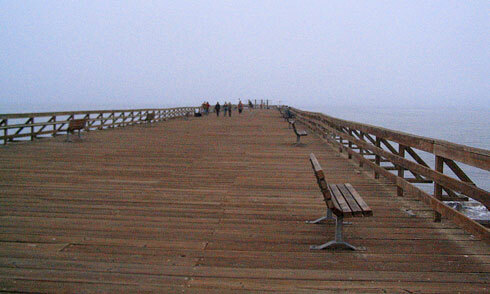 Yes, images of that long pier in the distance echoed in what seemed like ancient memory. Still standing near the entrance, I looked to my left and noticed a colorful sign explaining the dangers of riptide, and I pitied any lost soul who dared swim in these waters, for I knew the secret. I knew what had caused the tragedy exactly 80 years before my arrival. I surveyed the beach. Combined with a stubborn haze, the overcast clouds gave the entire scene a blue, gloomy look; and up ahead the sea seemed to merge with the sky into an unholy, unnavigable soup. In the distance, I saw the stone monolith, but I looked away. Not yet. Not yet. Instead, I walked along beach in meditation for some time, but I knew I would be drawn to walk down the long pier once again, just as I had as a child long ago. When I could resist no longer, I walked up the beach and stepped onto the long pier, the same pier that led to the results of the tragedy that had occurred long ago. And with understandable hesitation, I made my way down the pier to the immense grotesqueness that waited for me at the other end. Along the way, I passed such unspeakable things. 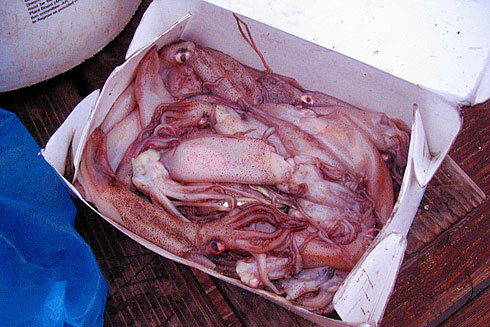 For some ineffable reason, I observed a box of dead squid on the edge of the pier. Having been stolen from the unfathomable watery depths, they had been reduced to a pile of lifeless blobs, their eyes still open and evoking the appearance of pure shock. Soon, I saw the vessel in its entirety. Around it, the sea itself seemed to form a hellish black mire which the ship was no doubt anchored to for all eternity. The ship itself was tortuously long and loathsome, and atop it were hundreds of blackened birds. And a closer examination filled me with sensations I cannot express. Indeed, mere photography cannot grasp the scope of this grotesque vessel that had been turned to stone so many decades before. Of course, being people of science, I doubt you will believe this, but how else can you explain a ship that is made entirely of stone? Haven’t you heard the legend? After all, who would build a ship made of stone? No one. At least, no one of sane mind. And then, the great tragedy occurred. According to the story, one of Tesla’s energy devices was successfully used to open a portal to another world. The crew rejoiced… until they saw what tried to come through. It was vast and unspeakable, and if it were to enter our world it would release universal pandemonium. In a panic, they rushed to close the portal—but not before a final blast of energy emerged from it, changing the molecular structure of the ship and its crew forever. In an instant, the otherworldly energy transformed the ship into solid stone. 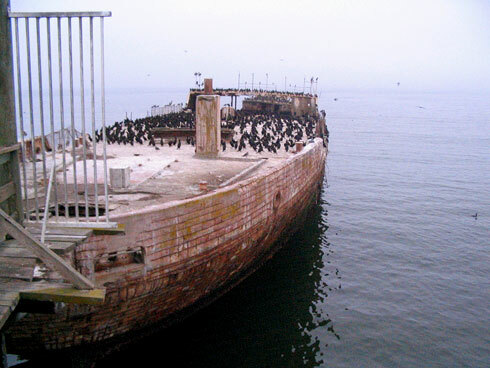 The fate of the crew was even more hideous, for just as the ship was once lovely and useful before that day, the hundreds of birds that now sit on the vessel were once its crew. Since that day, they congregate together atop the rotting vessel in desperation as the memory of their human lives slowly fades. Only by staying together do they fight the tide of forgetfulness and remind one another of who they truly are. It will not surprise long time readers to hear that Marco the Spacefarer continued to follow me on that day and therefore appears in all 8 photos in the photo gallery that accompanies this article. The “Where’s Marco” game is like Where’s Waldo or “I Spy”, but more challenging. Can you find him in all 8? Let it be known that the legend involving SS Palo Alto is currently unsubstantiated and intended to be enjoyed solely in your mind. Offer void where prohibited. Not valid in the State of Utah. No motorcycles after 3PM. 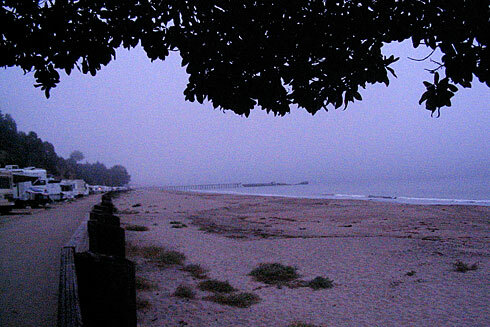 All photos from this event are in the Seacliff State Beach photo gallery. All photos in the Byteful Gallery are under a Creative Commons license. Tell a friend about Byteful Travel… if you dare. What a wonderful description! You kept me reading to the end with baited breath. I especially liked your placement of the dead squid in the article. I don’t know if it was on purpose, but at first I thought that they were what was waiting for you at the end of the pier and it made me smile! Excellent description of the place.. It sounds like a really amazing place indeed.. I really enjoyed visiting here… Thanks for posting!